Description: Although their lives have changed since their first desperate renovation of Bella Flora, friends Madeline, Avery, and Nicole have always been there for each other. Now they’re returning to Bella Flora for Christmas—where Maddie’s daughter Kyra isn’t feeling particularly celebratory. My take: If you’re up to date with the Ten Beach Road series this novella will tide you over until the release of Best Thing Ever next May. If you’re not, you’ll get to know the principal characters and a basic idea of how they fit into the storyline of the series. It’s the week before Christmas and all is not calm. Bella Flora, the gorgeous home that brought the women together in the first place, is filling up with Maddie and daughter Kyra’s friends and family.They’ll celebrate the holiday together and then move out so the home can be rented. The rent will help save Bella Flora from going into foreclosure. A Bella Flora Christmas is told from Kyra’s POV which made me feel her anxiety over a decision she has to make by the first of the year. That decision will impact all of her friends – so no pressure there! Since I’ve read the entire series I know the history and cause of her indecision. I expect that thread will carry through the next book. It was fun to find out what was going on in each woman’s life and I’m eager to see the direction Wendy Wax steers them next. Recommended to fans of the Ten Beach Road series. 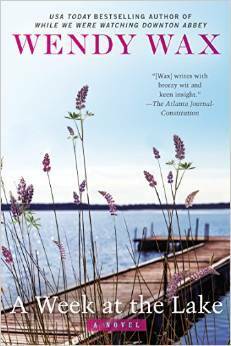 My take: One Good Thing is the latest book in Wendy Wax’s Ten Beach Road series. The four women – Maddie, Avery, Nikki, and Kyra – are at a crossroads with their Do Over home refurb tv show. They are trapped in a horrible contract with the tv network that took their show and turned it into an embarrassing reality show. They want to find a way out of the contract and maintain control of the show. The odds don’t look good. Individually each woman is facing life-altering change. They will rely on one another to help get through the challenges. I’ve enjoyed this series so much because it features women of all ages and experience in a realistic and positive way. The Florida setting is so inviting and I love the home refurb storylines. I like the parallel of the women’s lives being improved while they renovate homes. There were a few unresolved storylines at the conclusion of One Good Thing so I’m hopeful the series will continue. I suppose this novel could stand alone but so much context will be gained if you read from the beginning. Recommended. Fan favorite and USA Today bestselling author Wendy Wax is known for transporting readers to beautiful seaside locations with her smart, fun and utterly compelling stories. Inspired by her childhood summers and set on the backdrop of St. Petersburg, Florida, Wax’s Ten Beach Road series is equal parts authentic and charming. In her fifth and most exciting book yet, Wax returns to her Ten Beach Road series with ONE GOOD THING (Berkley Trade Paperback Original; April 25, 2017; $16). Picking up where Sunshine Beach left off, fans of the series will delight in catching up with familiar beloved characters and new readers will have no problem sinking into this witty and heartwarming story about loyalty, friendship and the secrets that test those bonds. Sure to resonate with readers of Elin Hilderbrand and Jane Green, ONE GOOD THING is a warm and insightful look at love and the bonds of true friendship. My take: If you can’t get to the beach this summer you’ll feel like you’re there when reading Sunshine Beach. Maddie, Avery, Nikki and Kyra are back together looking for a new renovation project. While on a morning walk Kyra comes across a small, partially hidden, falling-down but perfectly situated hotel and just knows it has potential. When the other women agree they assume their roles and get the wheels of renovation turning. Wendy Wax’s novel hit all the marks I’ve come to appreciate in this series: women’s friendship, perseverance when life gets tough, and the ability to get along even when they didn’t always agree. There’s a mystery to solve along the way and the return appearances of all love interests from the previous novels. I enjoyed it all and recommend it to fans of the series and women’s fiction. This book can stand alone but I recommend reading the series in order because you’ll get a deeper understanding of the growth in each character. Also, I’m the type of person who can get sucked into a HGTV marathon so I loved reading about the project at the center of each novel. 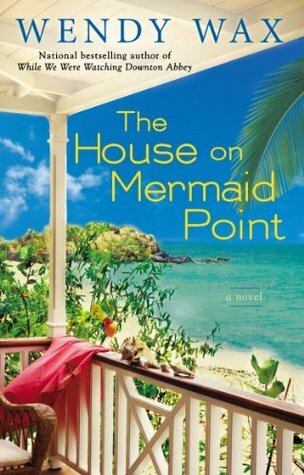 Q: Wendy, thanks for joining us and sharing news of your new novel THE HOUSE ON MERMAID POINT. So many readers are delighted to have a chance to be back with Maddie, Avery and Nicole, the characters you introduced in TEN BEACH ROAD a few years ago. Was it difficult to get back into their lives? A: You know, I thought it would be. I was still so caught up in the fun of WHILE WE WERE WATCHING DOWNTON ABBEY and readers’ response to it, that I began to question whether I’d be feeling “at home” with the reassembled ensemble as I had when I wrote OCEAN BEACH. As it turned out, I found myself immediately at ease when I started that first chapter and looking forward to finding out how they would tackle the challenges I knew were coming. I know it helped that I had already spent time with them while writing my holiday novella, CHRISTMAS AT THE BEACH. Q: Has a lot changed for the women of TEN BEACH ROAD since OCEAN BEACH? A: There have been some big life changes, but the characters are still friends, still taking things one renovation at a time. The cast of “regulars” has gotten bigger as characters from the first book have become more involved from one book to the next and become known to readers. Mermaid Point becomes host to the entire Do Over cast and crew – some with small roles and others central to the plot. You’ll find everyone from Kyra, Dustin and Deirdre to Chase, Joe, Troy and everybody’s favorite, charming network executive Lisa Hogan, who once again claims the element of surprise as her ace in the hole. Q: For those who are just now discovering the novels these characters share, will you give us some background? A: You bet. Readers first met Maddie, Nicole and Avery when the three were deeded ownership of Bella Flora, a crumbling historic home on Florida’s Pass-a-Grille Beach, in TEN BEACH ROAD. At that time, all they dared hope was that renovating and selling it would let them rebuild their lives and the bank accounts drained by a Ponzi scheme. They had no idea they’d end up living together for the next two summers, hammers in hand, starring in their own DIY reality television show, Do Over. Indeed, in their second book, OCEAN BEACH, the women – still in desperate straits financially – headed to Miami’s South Beach, with another project and cameras rolling to film their first season. In THE HOUSE ON MERMAID POINT, the show is about to make its on-air debut even as they film their second season. This time they’re in the Florida Keys where they’re expected to turn Mermaid Point, the private island of aging, down on his luck rock legend William Hightower, into a bed-and-breakfast. Against his wishes, of course. Q: Rock ‘n roll and renovation? How did you arrive at that combo? A: It started with again needing a character who, to begin with, could afford the sort of house that would make an interesting television setting. So I started thinking celebrity. Then, during my early research, I fell in love with the Florida Keys. I was headed to Key West when I was shown a private island in Islamorada that I just had to have. Then I needed a really high-profile, extremely wealthy – at least at one time – mega star. Lots of musicians lived and partied in the Keys and before I knew it, I was thinking about some of my favorite bands and Southern rocker William “Wild Will” Hightower was born. Q: Who are some of your favorites? A: The Allman Brothers, Lynrd Skynrd, Wet Willie… It was a kick revisiting those times and walking down my own memory lane helped me imagine Hightower’s music being just as magical as that of the musicians I followed and the wild ride that is part of his past. I may have had a bit too much fun with the musical memories called up during the writing. I actually ended up trying my hand at a ballad, Mermaid in You, one of the songs for which my mythical Hightower became famous. As part of the release of THE HOUSE ON MERMAID POINT, I touched base with two young musicians who are sons of a friend. Their group is the 10th Concession and they’re well-known in the southeastern US. They looked at my lyrics and, while I was quickly demoted from writer to co-writer, they worked with me, created the music and now the song has been recorded. It has its live performance debut along with the book on June 30th and will be available as a free download. I hope you’ll check it out. Info will be posted at authorwendywax.com as we get closer to the date. A: I am happily up to my neck in a new book. But I’m still debating so many different ideas that I don’t want to share too much yet. Lots keep changing. It is, however, set in Manhattan and at New York’s Lake George. More to come… As always, I’ll be sharing more book news on my site, on Facebook and other places. I hope everyone will visit with me in those spots. Also, appearances for and the latest about THE HOUSE ON MERMAID POINT will be shared online along with giveaways and other updates. A: Thank you! I appreciate being able to share THE HOUSE ON MERMAID POINT with you and visitors to your site.